In case anyone doubted just how big of a nerd I really am, I'm proud to announce another blog, the LS3P Knowledge Center, that I've recently started up based on my work as a researcher at LS3P ASSOCIATES LTD. I haven't discussed it much here, but believe it or not I don't spend all day every day working on LEED project management. In fact, my primary job is to collect research that could influence the way we design and construct facilities... how can the design of a school increase student test scores, how can material selection work to reduce infection rates in a hospital, or what impact does an office's physical characteristics have on employee satisfaction? Interestingly, it was the massive amount of research being performed on sustainable design and construction practices over the last decade that drove me into LEED project management in the first place... Within six months of starting at LS3P I had earned my LEED AP title. I was doing so much research on the costs of LEED, examining the most effective strategies to implement, and helping to prove the value of sustainable design to our clients that I was soon tasked with assisting our project managers in completing the documentation itself. I jumped on the opportunity and about a year and a half later I was effectively an in-house LEED consultant and shortly thereafter I started Real Life LEED in my spare time. Don't worry... Real Life LEED isn't going anywhere, as the Knowledge Center will be handled through my regular working hours, but I'm really proud of the content we already have loaded and I'm very excited about the contributions of others in our firm that started last month and will continue into the future. If this sort of thing interests you, please check it out! More research = good. 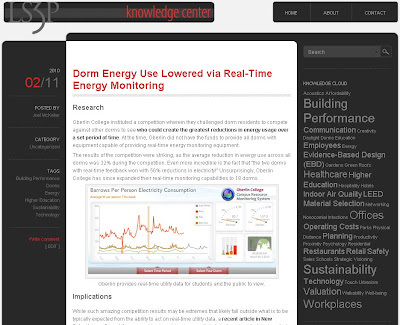 Looking forward to following your Knowledge Center blog too. Keep it up. Thanks for the update and well written informative blog you shared with us. Looking forward to read more of your blogs!